The Ultimate Guide for WordPress Security - Wordsuccor Ltd.
Security of our website is usually never our top priority until our website gets hacked by a malicious party. WordPress being the most popular and widely used platform for creating website is extremely vulnerable to spammers and hacking. It was observed that more than 170,000 websites were hacked in 2012 and the number is growing each year. However, you need to be proactive than reactive in regards to WordPress security. Do not take your website for granted just because it hasn’t been hacked till now. Even websites with low traffic and search engine rankings are vulnerable to attacks. Why hackers attack your website? Wondering why your website is at risk, especially if it has low rank and traffic? Well, there can be many motives behind it. There are some people who think its fun destroying other’s things. Also the main motive behind it is profit. Hackers are not looking for any sensitive data and essential files. They usually want to send spam mails from your server. These spam emails are sent for free. Emails are sent easily and quickly, and they are usually hard to track which makes it easy for the hacker to earn profit and double the pay off. How do hackers find their way in? The fact of the matter is you can rarely prevent the attack if your website isn’t already secured enough. However, it is important to know how the hackers find their way in just to prevent your site from them. Though there are various ways of gaining entry to a site, the main ways can be categorized into four main categories. As 41% of the sites were attacked through a hosting platform, this, itself, covers many techniques to gain entry to your website. SQL injection is the most common and popular technique to hack a WordPress. Hackers add few lines of code in the database, which enables them to change the sensitive data in the website such as password, and username. This also allows them to add or delete your pages or posts as well as add any type of link. Another popular way of gaining is through WordPress plugins or themes. Hackers can add eval base 64 decode code which enables them to make modifications in the PHP function file. This technique also enables them to gain access to your site in the future as well. As a matter of fact, hackers are not after websites where they need to win a long battle to gain access. They are only targeting sites that are vulnerable to attacks and sites with security loopholes. Therefore, it is pretty easy to block 99% of the attacks merely by keeping security problems at bay. Here in this section, we have tried to include everything you can do to prevent your website from attacks. Remember it’s always better to be safe than sorry. As we discussed earlier, 41% of the attacks happen through hosting platform. Therefore, it is important to choose a good hosting company that keeps security at the highest priority. Passwords do play an important role in WordPress security. After all, 8% of the websites are attacked because of the weak passwords. Don’t invite hackers on your site by keeping weak and feeble passwords. If you have passwords like “admin123” or “website@123”, you have to change it right away. Your password should always be a combination of letters, numbers and symbols. 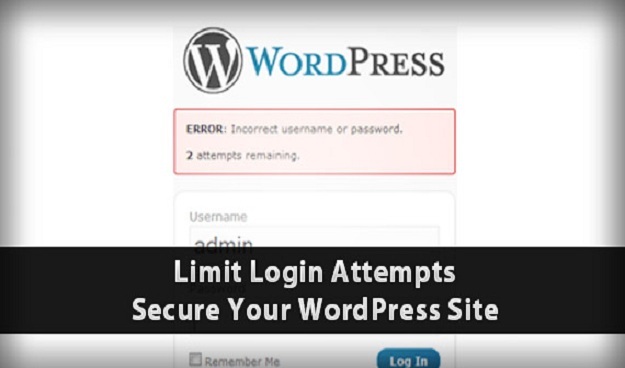 In WordPress you can limit login attempts to prevent continuous and constant attacks on your website. This way you can lock out a particular IP from where your website has been attacked multiple times. Though it has some loopholes since hackers use different IP addresses, it’s still worth it. Back up should be done every now and then. It is something which is usually overlooked. Webmasters don’t realize the importance of backing up the website until it’s too late. Even if you have used the best practices for WordPress security, you never know when anything wrong happens. You want to ensure that your website is safely backed up. You can also schedule automatic backups for constant updates. Keeping the security of WordPress in mind, many contributors and volunteers have launched many security plugins to help WordPress website owners to prevent hacking. There are many plugins available such as iThemes security, All in One WP Security and firewall, WordFence, BulletProof security and many more. Choose the best one according to your needs and install it right away. If you any of your theme or plugin causes an error, it may display the server path on the webpage. Hackers are always on the lookout for such information. They can use this path to gain an access to your website. Therefore, it is always advisable to disable error reporting. Make few changed in the wp-config.php file and disable error reporting with the following code. This may sound pretty overwhelming for you particularly if you are a beginner. However, keeping all these point in mind can actually save your website from hackers. Make sure you don’t leave any room for the hackers to attack your website.